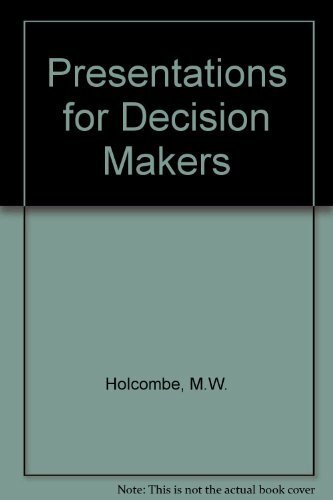 Presentations for Decision Makers provides a practical system for developing strong persuasive content to get buy-in from decision makers as well as clear guidelines for creating visual support - both of which made the first two editions so popular. This new edition has been expanded and revised to address the roles played by emerging technologies, heightened expectations, and increasing global communications in business presentations today. Presentations for Decision Makers shows you how to use new technology to your advantage, provides guidelines for learning about different cultural mores you may encounter, and considers how to recognize and relate to people with differences in thinking styles in a meeting. It addresses each step in the process, from planning the presentation through creating visuals, rehearsing, preparing for questions, and managing participation in formal, informal, and video conference settings. You will come away with clear, effective strategies for getting your message across. No matter what your role in business, if your job involves communicating with others, you'll find a wealth of practical, usable advice in Presentations for Decision Makers. No matter what your role in business, if your job involves communicating with others, you’ll find a wealth of practical, usable advice in Presentations for Decision Makers. 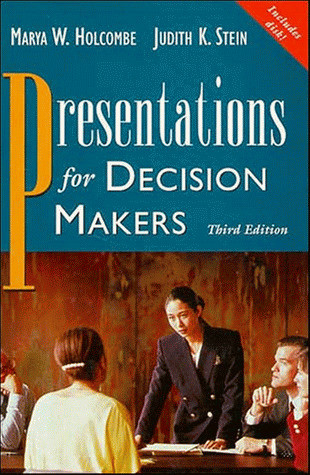 Praise for Presentations for Decision Makers, Third Edition "The people who come to our door seeking venture capital could use the advice in this book, particularly the emphasis on content and clarity over gimmickry, the insights into reading and managing audiences, and the analysis of different media. Not only is the book fundamentally sound; it is written in a practical, useful manner." — G. Leonard Baker, Jr., General Partner Sutter Hill Ventures "I spend the better part of each day listening to presentations — both formal and informal. No matter how funny the jokes or how smooth the delivery, I’m fundamentally interested in one thing — whether the presenter is giving me the information I need to make a decision. Presentations for Decision Makers provides the tools that help anyone structure and deliver a presentation that gets action. I’ve been using and recommending the author’s techniques for over 15 years. They get results." — Steve Keeble, Chief Executive Officer CDA Investment Technologies "This is the most practical guide to more informative and more interesting communications skills I have seen. Everyone can benefit from its approach; for no one is a "good enough" communicator." — Vernon R. Loucks, Jr., Chairman and Chief Executive Officer Baxter International Inc. "By far the best book I have seen on the art and science of delivering effective presentations." — Benno C. Schmidt, Jr., CEO Edison Project "Marya Holcombe does a masterful job of improving her clients’ presentation skills. If you can’t work with her in person, read the book. Marya and co-author Judith Stein provide a wealth of information on adding style to your substance. I recommend Presentations for Decision Makers with great enthusiasm." 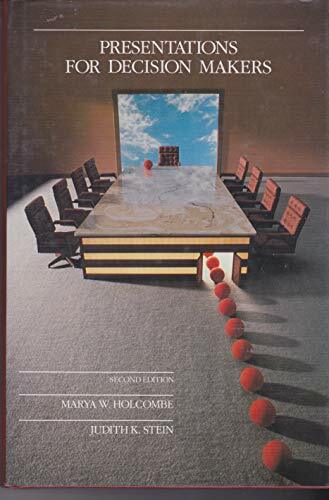 — David F. Swensen, Chief Investment Officer Yale University Updated and Expanded Third Edition This third edition has been completely updated and expanded, with new chapters on presentation technology, global presentations, and presentations by teams. It gives the reader all the necessary information for presenting in today’s high-tech, international business environment. Also included with the book are convenient templates for creating your own presentations in Microsoft® PowerPoint "Auto-Formats," and visual examples that show how to use (and how not to use) color within a visual.